Whatever your reason, it’s always a good idea to get your facts straight before you take the plunge and booking your appointment. Firstly, what is a UV/Blacklight tattoo? Well, a black light is a lamp = that only shows colors on a particular wavelength. They are the kind of lights you will see in nightclubs, bars, raves and occasionally TV shows about dirty hotel rooms! If you’ve ever been somewhere where the laces in your shoes and teeth look crazy bright, you’ve been under a blacklight. 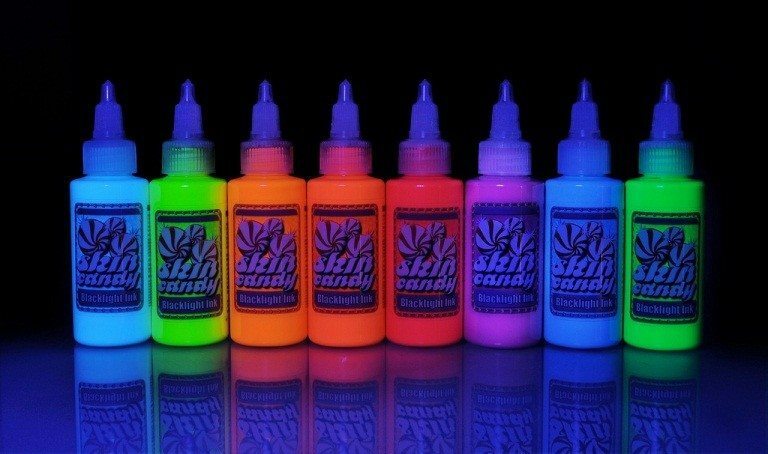 A UV tattoo is created using special UV reactive ink that is almost invisible in normal light but shows up very brightly under a blacklight. Add some flair to your nightlife! Where does your UV tattoo ink come from? Although the US Food and Drug Administration (FDA) has not approved any types of tattoo ink for use in humans, several types of ink have been approved for use on (non-human) animals. This is the type of ink that used by reputable tattoo studios. Unfortunately, there is a big market in low-grade inks that contain numerous unsavory chemicals (lead and mercury for example), mostly coming from China. They are far cheaper, and so a lot of studios, unfortunately, choose to use them. At ALL DAY Tattoo, all of our inks are of the highest standard and are well known, Industry Standard brands imported from the USA. We would never compromise your health by going cheap on our equipment. How Invisible is UV ink? It is not entirely invisible, especially for the first year or two. There are several reports that once the tattoo has properly healed, however (this takes around 12-18 months), the tattoo will be virtually invisible to the naked eye. If your motivation for getting UV ink is to have a tattoo that is completely invisible, it’s important you research others who have had a UV tattoo done in a similar location and see whether the outcome they had is one you’re happy with. Having the right artist for the job. You wouldn’t hire Picasso to draw a realistic family portrait, and you shouldn’t just hire any old tattoo artist to do your UV tattoo. Make sure that your artist has experience in both the style of tattoo that you want to get AND can work with UV ink. Tattoos are with you for life, so if you need to pay a little more, or wait a little longer, to get the right tattoo from the right artist for you – make sure you make that investment in yourself. At ALL DAY Tattoo, we are here to help. If you’ve got any questions or concerns about getting a UV (or any other type!) tattoo with us, just get in touch. Our aim is to make sure you’re happy throughout your whole tattoo experience, so feel free to reach out to us. Book a no-obligation consultation with us now to see what we can do with your tattoo idea!